Kirk Bell January 22, 2019 Comment Now! I walk around pitlane and inspect the tires before I check in for laps. Confirmed: The front tires are 20-inchers. The rears are 21s. It’s one thing Porsche has done to nudge the 911 ahead, in small steps, to be the best 911 yet. 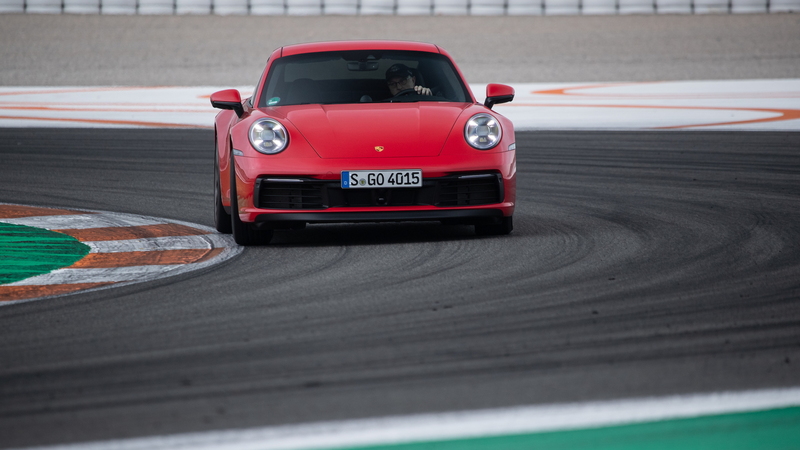 “It helps us a lot when we enlarge the diameter of the rear wheels,” August Achleitner, vice president of the 911 and 718 product lines, tells me at Circuit Ricardo Tormo outside of Valencia. He’s called Mr. 911 for a reason. Achleitner has led the 911 program since 2001. He knows staggered tires can generate useful extra stick. What Mr. 911 says goes. The wheel diameters are upsized front to back. As I’ll soon find out, it works. The larger-diameter rear wheel is a time-honored trick, one Porsche already performs with the treads on its 911 GT3 and GT2 RS cars. Achleitner says the larger diameter came late in the development process, then explains how it affects the car’s character and many of the car’s other changes. With less flex in the tire sidewalls, the benefits include improved turn-in response and more neutral and controllable handling. But the taller rear wheels also lift the body up higher in the rear, so the whole design needed to change. The larger wheels and tires add weight, which Porsche countered with revised suspension tuning and a lighter body. The body now uses just 30 percent steel (down from 63 percent) and far more aluminum to save 26 pounds. And yet the new structure is 5 percent stiffer in both bending and torsional rigidity than before. However, additional equipment and structural reinforcements to accommodate a future hybrid model account for an extra 163 pounds overall for the S model, slightly less for the 4S. CHECK OUT: 2019 BMW 3-Series first drive review: Benchmark or bookmark? While the wheelbase is unchanged at 96.5 inches, the 911 grew longer front and rear by a total of eight-tenths of an inch. The extra space at the rear leaves room for the hybrid system that could come in 2022 or later. The larger wheels led Porsche engineers to widen the rear track by 1.5 inches on the S model to match the 4S’s track—all S models are now wide-body cars—and widen the front track by 1.8 inches. Those changes improve traction and lateral stability. Oh, and power. The 911 S models tap an updated twin-turbocharged 3.0-liter flat-6 that now makes 443 horsepower and 390 pound-feet of torque. More on that later. Through the luck of the draw I’m first up on the 2.4-mile road course. I’m nervous that the cold Pirelli P Zero summer tires will give up grip rather easily in the brisk weather. Instead, I find that the 911 has tenacious grip and unflappable stability. Porsche’s chassis changes make what was a great car even better for 2020, though incrementally. From the 14-way power sport seat, this 911 4S feels like an arrowhead shooting forward. That wide rear end does the hard work of downloading all that power, applying most of it to the ground (between 25 and 33 percent goes to the front axle when needed), and rocketing the car to the next turn. At each corner, the car turns in with confidence thanks to the weighty, direct, and stable steering that works in symphony with the composed chassis. The 911 4S stays on its line, and carves a perfect arc through each apex to the exit point. It doesn’t matter if I go in a little too hot or get on the throttle a little too early, the 911 4S just hurtles ever forward. It does it all while the engine hangs behind the rear axle and only 39 percent of the weight sits up front. Physics be damned: Porsche has invested 55 years of engineering expertise into defying physics. A standard electronically controlled limited-slip rear differential is partly to credit for the stability. It comes with torque vectoring that sends more power to the outside rear wheel in turns. Put the power down sooner when exiting a corner the new 911 doesn’t care much. I start out slower than I normally would due the cold, but the great mass of tire beneath the car inspires confidence and I pick up the pace. With 305/30ZR21s out back and 245/35ZR20s up front, the 911 lays down big contact patches to create both grip and stability. The grip is astounding. This car is unflappable. As I approach the turns, both slight and sharp, the standard iron brakes offer a firm and progressive pedal feel, even when arresting speed from the 150-mph straight. Due to the extra weight and bigger tires, the S models now use 13.8-inch diameter rotors all around (versus the 991’s rear 13s) with 6-piston calipers up front and 4-piston pinchers in back. A new electric compressor ensures they build up the same amount of pressure every time but has no detectable effect on pedal feel. It’s hard to get the 911 out of sorts. Recorded data through the updated Porsche Track Precision app shows that I never activate the stability control during my rather spirited run. A sport version of the stability program is available in Sport+ mode (activate it by holding the stability control button for a second). It allows more slip angle, but a driver would have to make a concerted effort to make the 911 do anything other than slice a consistent line. I am intent on not being that guy, especially when we’re recording laps. The latest 911’s options offer even more track potential: Porsche Active Suspension Management drops the car 0.4 inches and makes it stiffer; rear-axle steering cuts a sharper line in corners below 31 mph; active roll bars quash any slight lean; and carbon-ceramic brakes shorten stopping distances. Skip all that? The 911 is still a track star. The dynamics are one main element of the track experience. The feel of speed is the other. 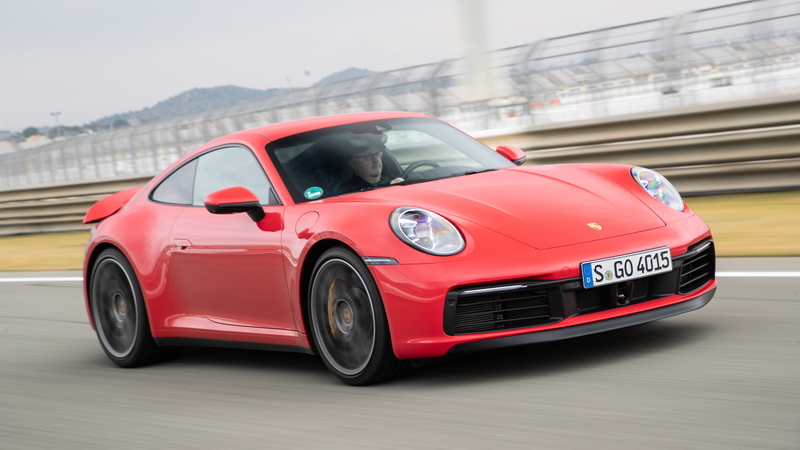 The new 911 S and 4S use the next generation of Porsche’s twin-turbocharged 3.0-liter flat-6. Porsche engineers made changes throughout the engine to improve power and efficiency. First, it breathes better. The turbos get larger turbine and compression wheels. They huff and puff and blow 16 psi of air into the engine’s combustion chambers. The excess can now be blown off with an electrically controlled wastegate, and the intercoolers have been moved inboard where they do a 14-percent better job of cooling the air for the intake. Inside the engine, piezo injectors work more precisely than the solenoid injectors they replace, while the VarioCam Plus variable valve timing now uses intake valves that open with different degrees of lift under partial loads. Together, these changes provide a better mix of air and fuel, better combustion, better emissions, and smoother engine operation at low loads. All told, the engine improvements add 23 hp for a total of 443 hp at 6,500 rpm and 22 pound-feet of torque for a total of 390 lb-ft from 2,300 to 5,000 rpm. Those changes have a marked real-world effect. Stomp the angry pedal and the 3.0-liter flat-6 rockets the 911 S from 0-60 mph in 3.3 seconds, while the 4S makes the run in a scant 3.2 seconds, both with the optional Sport Chrono Package. The 3.0 delivers that power with a “whoom-whum” sound that is an integral part of the Porsche experience. Engage the Sport+ mode and a cadre of baritone angels join the chorus. With 61 percent of the power over the beefy rear tires, the 911 puts its power to the pavement with amazing efficiency. Power comes on with an immediate rush and keeps pulling. The all-wheel-driven 4S is even more efficient, as it can now send an additional 37 lb-ft of torque to the front wheels, which snuffs any wheelspin during takeoff. An easy-to-use launch control mode makes the 3.2-second 0-60 mph time easy to reach and repeatable time and again. Just get ready for a shock to the spinal column. All that power flows through a new 8-speed dual-clutch automatic transmission that Porsche calls the PDK. It adds one cog this year, which allowed for new, shorter gear ratios for the first seven gears and a longer eighth gear for better efficiency. The PDK remains the best dual-clutch transmission on the market. It’s smooth or lively, depending on the mode. Sport+ is especially effective, as it shifts with lightning speed and chooses the right gear during track driving to keep the engine in its power band. 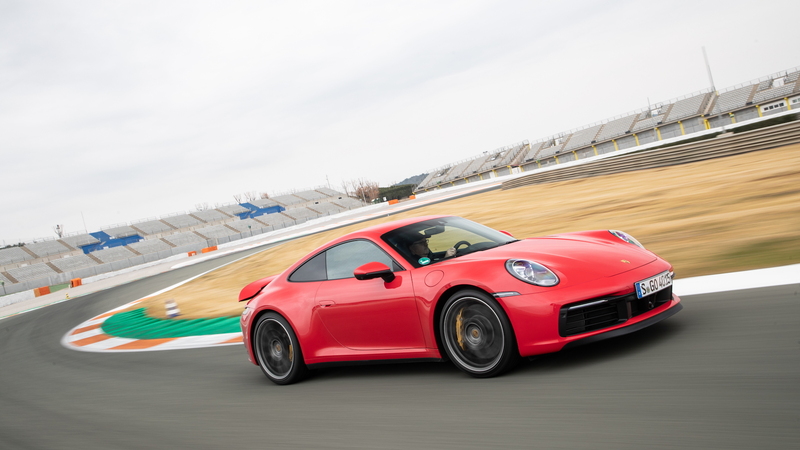 Between the added power and the chassis upgrades, the 2020 Porsche 911 Carrera S posted a 7:25 lap time on the Nürburgring Nordschliefe, 5 seconds faster than the 991 Carrera S. That’s in improvement for sure, but an incremental one. Inside, the new 911 gets a look that honors the past while embracing the future. A new horizontal dashboard layout recalls 911s from the early years all the way through the 993 generation of the 1990s. At the same time, the 911 adds a new 10.9-inch touchscreen that comes standard with connected navigation to provide real-time traffic information. The screen offers pinch, stretch, and swipe controls, and is programmable with a widget for the right side of the screen so drivers can add the control they use most often. Porsche also adds safety features this time around. Active features include forward-collision warnings with pedestrian detection and automatic emergency braking, updated adaptive cruise control with stop-and-go capability, blind-spot monitors, and active lane control with traffic sign recognition. Surround-view and night vision camera systems are also available. While the 992 is a brilliant car, I have a few minor complaints. The base trim around the shifter and along the bottom of the dashboard is a textured plastic that doesn’t belong in a 911. I have mixed feelings about the new, dainty shift toggle. It works well, and Porsche made it smaller so engineers wouldn’t have to build a beefy structure that can handle the torque drivers apply to a large lever, but I prefer a traditional, bigger gearshift. Buyers who want a 7-speed manual will have to wait, and they will get a substantial lever. The new door handles also don’t pop out far enough for my taste. That’s the sum of my complaints. 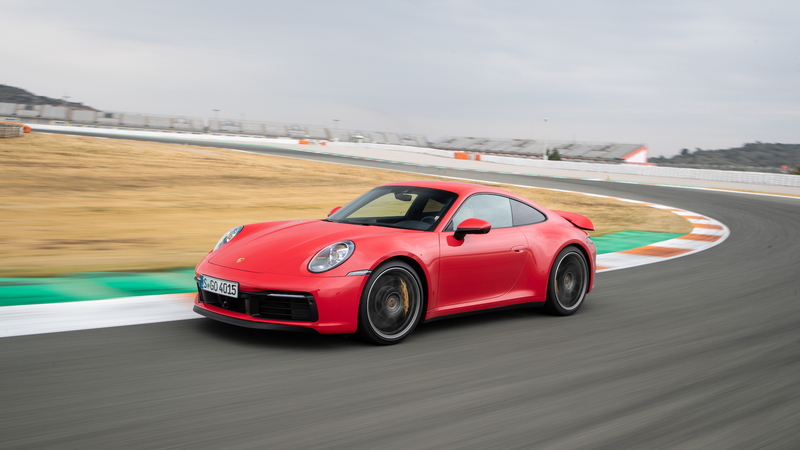 Otherwise, Porsche’s changes to the 2020 Porsche 911 S and 4S and make it faster, more comfortable, more agile, and more connected. The 2020 Porsche 911 is better than the car it replaces. Not by leaps and bounds, but incrementally. Then again, when you start with brilliance, an incremental improvement is an accomplishment that can result in a car with unflappable handling. It starts with bigger wheels—but it surely doesn’t end there.